Required: Enter your complete Iridium or Inmarsat phone number(MSISDN) or inReach SE/Explorer IMEI number. If registering service for an inReach, enter the NAME which is IDENTICAL to that associated with your Delorme account (to confirm this name, send a text from your inReach device to your personal email address). There is a minimum one-month term on all SpotCast (FlyCast) accounts. Your SpotCast (FlyCast) account will thereafter auto-renew monthly until OCENS receives an email from you advising us to expire the account or move it to Standby status. NO account is expired without written confirmation. SpotCast (FlyCast) Standby status is billed at a monthly rate which is 30% of Active status. 2) Device-specific setup instructions are presented elsewhere on this website. 3) SMS text messaging protocols and rates specific to your device apply. 4) Availability of limited service: Service is generally available to inReach, Iridium or IsatPhone terminals equipped for this service when within the subject satellite footprint. Satellite service is provided through the Iridium or Inmarsat satellite networks. The satellite and/or data service may be temporarily interrupted, delayed or otherwise limited. OCENS makes no representation that it can provide uninterrupted service. Further, OCENS shall have no liabilities or credit due for interrupted service. OCENS shall not be liable for acts or omissions of other carriers, providers, or suppliers, equipment failures, or modifications, acts of God, strikes, government actions, or other causes beyond our reasonable control. 6) OCENS SHALL NOT BE LIABLE TO ITS DISTRIBUTOR OR CUSTOMER OR ANY THIRD PARTY FOR ANY SPECIAL, INCIDENTAL, OR CONSEQUENTIAL DAMAGES. IN NO EVENT SHALL OCENS BE LIABLE FOR ANY INDIRECT, INCIDENTAL, COLLATERAL, EXEMPLARY, CONSEQUENTIAL, OR SPECIAL DAMAGES OR DAMAGES FOR THE LOSS OF BUSINESS PROFITS, BUSINESS INTERRUPTIONS, LOSS OF BUSINESS INFORMATION OR OTHER PECUNIARY LOSSES ARISING OUT OF END-USER’S ORDER OR USE OF SERVICE, DATA OR DOCUMENTATION DELIVERED UNDER SAID ORDER OR OUT OF THE WARRANTY, INCLUDING WITHOUT LIMITATION, LOSS OF USE, PROFITS, GOODWILL OR SAVINGS. Some states do not allow the exclusion or limitation of incidental or consequential damages, so the above limitation or exclusion may not apply to you. 7) Governing Law: This contract is governed by the laws of Washington State and applicable tariffs. Customer agrees that any legal proceeding commenced by one party against the other, shall be brought in any state or federal court having proper jurisdiction within the state of Washington. Both parties submit to such jurisdiction and waive any objection to venue and/or claim of inconvenient forum. World-Wide Aviation Weather, METAR and TAF reports. No longer must pilots face critical flight decisions in a landscape empty of weather information. OCENS FlyCast Aviation answers the call for a better way to acquire the METARs and TAFs vital to your flight planning. It also can provide flight-specific aviation weather forecasts out 12 hours for any location on earth. OCENS FlyCast World-Wide Aviation Weather works directly through your Iridium GO!, Iridium 9575, inReach, or ISatPhone/2. Just type in your desired ICAO airport code and send. METAR and TAF reports are returned directly to your satellite device or its linked smartphone in just a few minutes. Or use the GPS feature of your satellite device to submit location information and receive flight-specific aviation weather forecasts covering any lat/lon. No longer must pilots face critical flight decisions in a landscape empty of weather information. The global footprint of OCENS FlyCast Aviation weather and your inReach SE/Explorer, Iridium 9575, Iridium GO!, or Isatphone Pro/2, leaves no corner of the earth uncovered. Easy connectivity and inherent positioning provide the essential architecture for requesting METARs, TAFs and flight-specific forecasts. OCENS FlyCast service uses your devices messaging and bandwidth capacity sufficient to receive these important weather observations and reports. OCENS FlyCast presently offers global access to aviation METAR observational and TAF forecast data. METAR and/or TAF reports are accessed by sending the four digit International Civil Aviation Organization (ICAO) airport code(s) of interest via an SMS message to the OCENS weather servers. 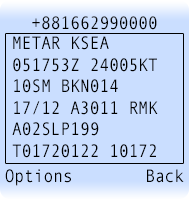 If METAR data is requested for one or more airports, only METAR data for those airports is reported. If TAF data is requested for one or more airports, both TAF and METAR data are returned. Coded METAR and/or TAF reports for the subject airport(s) are returned directly to the user within a few minutes of the requests being made. Samples are presented below. Each message is up to 160 characters in length. If a given TAF or METAR report is longer than 160 characters, the report is split into multiple messages by OCENS and passed to the user. Each message or message segment begins with the phrase TAF or METAR to identify the report type, the pertinent 4-digit airport code, and the date/time stamp for that report. METAR and TAF data are updated at OCENS servers on an hourly basis. While METARs and TAFs provide weather information critical to your flight planning, they don’t provide aviation weather conditions away from ICAO airports. They don’t provide insights into what conditions might be at a remote airstrip. Or a landing zone from which hikers, campers, climbers or boaters must be rescued. Or in-route weather conditions that may be changing rapidly. Each message is up to 160 characters long. If you have been assigned a voucher code and need to activate your FlyCast service CLICK HERE.